In April we continue our theme of highlighting teas from specific countries - this month we're celebrating teas from NEPAL. Nepal is a country with ideal tea growing conditions - great soil, high elevation, plenty of sunshine and rain - yet it only accounts for a mere 0.4% of the world's tea production. Although tea has been around in Nepal for over 150 years, the local tea industry is still in its infancy. The young tea industry in Nepal is one of the reasons this country produces such high quality tea. They use the highest quality cultivars (starter plants) and, because there is no mass production, each tea is worked in small batches with artisanal skill. Most of Nepal's tea growing regions are in the far east of the country, mere miles from the world-famous tea growing region of Darjeeling, India. Take a look below at the wonderful teas we've selected from Nepal. Also, this month’s Herbal Tea Box brings back some of the most requested herbal teas in our line up. All teas will be available in our web store in late April. We will take substitution requests for allergy concerns or even preference. All customization requests must be submitted by March 1st. If you would like to switch from one box to another - for next month only or for all remaining boxes - please click the button below. Dragon Claw Oolong is a rich and malty oolong that was given its name because of the claw-like unfurling of its leaves once it hits water. Golden in hue with notes of sweet and tart apricot, it deepens to a flavorful and savory finish much like a black tea with a delicious toasted nuttiness. We're huge fans of oolongs in general, but this one is just spectacular. We haven’t included it in a Tea Runners box since the summer of 2017, and we still get requests to bring this one back. Well here it is! Don’t miss out. This breakfast tea is a truly unique and exotic way to start the day. Steeping to a deep ruby red hue due to the addition of CTC leaves, it also sings with the bright and complex flavors of Orthodox tea. What really makes it a standout is its gorgeous layer of masala spice mix, leaving the palate awakened with notes of clove, cinnamon, ginger, and black pepper. Try it with some warm milk, or as a sweet treat, a touch of sugar. Ingredients: Black tea, cinnamon, clove, ginger, black pepper. 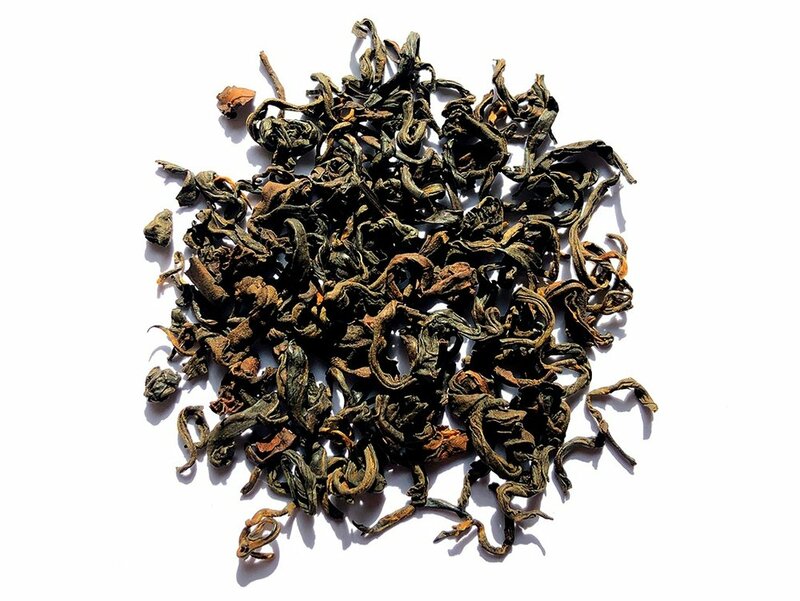 First Flush Black Yeti is grown just over the border in the Ilam region of eastern Nepal, in very close proximity to Darjeeling, India. This tea is very similar in character to a Darjeeling black, with notes of of sweet muscatel grape, honey, and sharp wintergreen. It has a smooth and elegant mouth feel with a delightful and well-rounded distinctiveness. This rare artisan small-batch tea is carefully rolled to give it a fine twist, then completely oxidized for up to 26 hours at an elevation of 6500+ ft. The constant flow of mist in the air at this elevation makes oxidation slow, allowing the artisan tea producer to achieve maximum desired color and aroma. It is then dried and matured with time and perfection. Lhotse Black is an excellent morning tea, lively and uplifting with stone fruit aromas and notes of raisin, roasted pecans, and chocolate. A premium green tea from Nepal, the leaves of this tea are roasted to preserve subtlety and smoothness in its flavor profile. Aromas of wildflowers and freshly cut grass mixed with the familiar marine scent common to high-end green teas make this a lovely spring offering. Sandakphu Silver is a classic Nepali white tea with downy silver tipped leaves and an elegant, silky mouthfeel. To create this fine tea, one leaf and one bud are picked during the spring harvest and dried under the moonlight. Nepali white teas have shown to be higher in antioxidants than teas from other countries. Sandakphu Silver has a fresh, fruity aroma with notes of stone fruit with a satisfying, nutty finish. At once subtle and complex, this wonderful everyday black tea awakens the body with well-balanced astringency and uplifting aromas of fresh apricot. Its maltiness satisfies the strong black tea lover while its quiet notes of spice leave the palate wanting more. This tea has been known to turn a coffee lover into a tea lover! This delightful caffeine-free treat is rich in good-for-you antioxidants. Its sweetness is pleasantly cut with tart rasberry, creating a perfect balance on the palate. Fragrant and calming lavender adds a sophistication to this tea, further enhancing its place as part of the ideal bed time ritual. A Tea Runners favorite! Ingredients: Honeybush, lavender petals, & natural flavoring. This tea steeps to a pale and delicate pink liquor but warms the palate with a full-bodied and flowery taste. Healthy rooibos is smooth and rich while loading the body with iron and calcium, making this a great herbal tea for all ages. The addition of blueberries and raspberries with tropical papaya and hibiscus slightly sweeten this tea, creating a perfect and well-rounded balance. Ingredients: Green rooibos, blueberries, papaya, orange peel, hibiscus, raspberries, mallow blossoms, sugar, marigold petals, and flavoring. 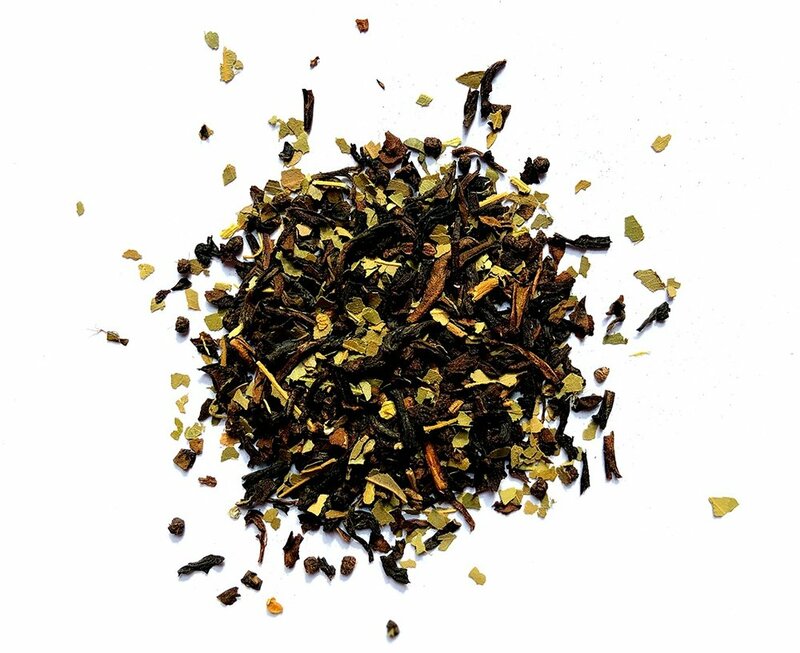 This spicy and bold tea packs a powerful punch, zinging with lots of ginger and lemongrass and arriving at a slightly sweet and tart finish with fresh orange peel. Lemongrass adds an exotic underlying element while superfood turmeric lends a gorgeous marigold color to this tea's liquor while rounding out the finish with an earthy pungency. Ingredients: Turmeric, ginger, lemongrass, orange peel, licorice and citrus essential oils. Try this tea in a mulled wine recipe, or serve it over ice on a gorgeous sunny day.